With the powerful Ambarella A12 processor, Vicovation Opia 2 delivers footage that’s sharper, richer and more detailed. Combined with powerful and brand new features: the upgraded Smart Parking Surveillance and Time-Lapse Video, Vico-Opia2 is the most advanced, highest-performing VicoVation dash camera ever. 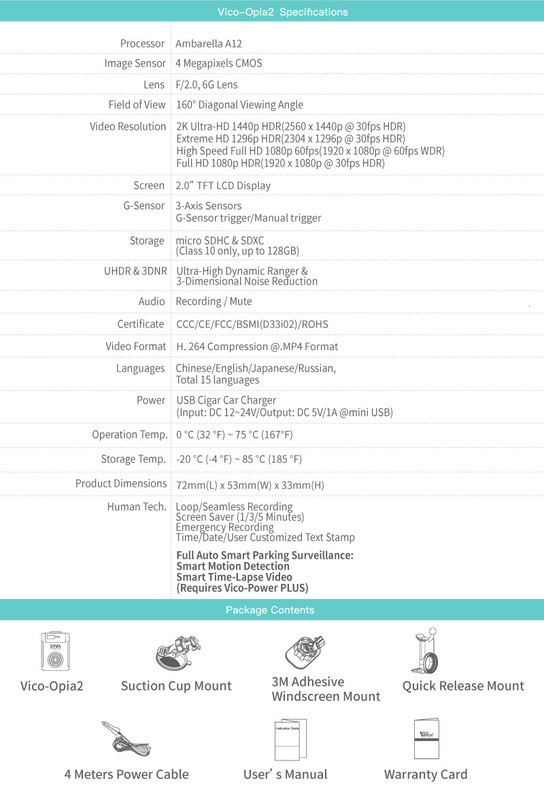 The Vicovation Opia 2 is the flagship dash cam from veteran dash cam company VicoVation. The Opia 2 features one of the highest end processors available, the Ambarella A12, which lets it record 2K (1440P) video at 30 FPS. 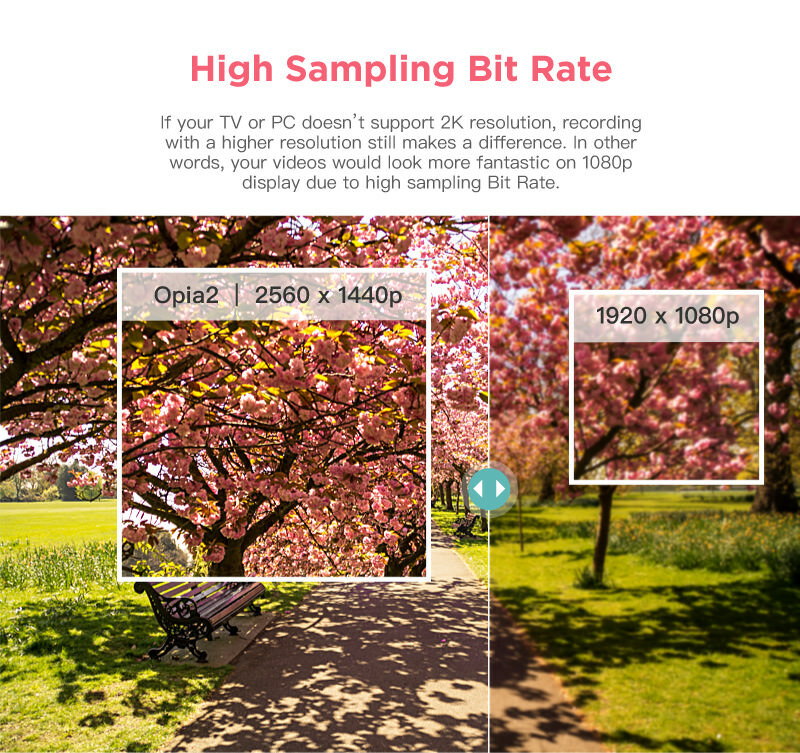 At the highest resolution, it records at an impressive maximum bitrate of 25 Mbps. 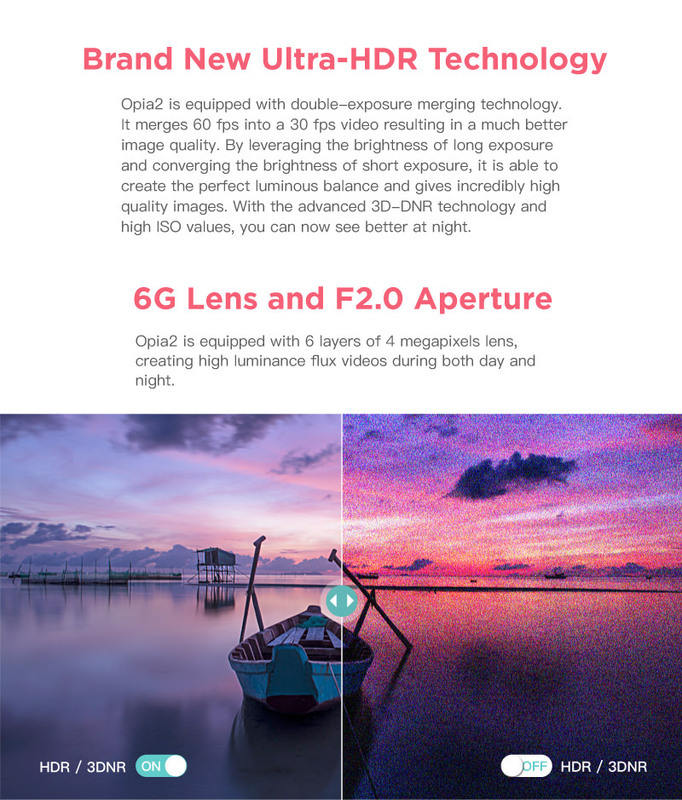 Those that prefer the smoothest video possible also have the option to record in Full HD (1080P) at 60 frames per second which helps reduce blurring significantly. The 160° F/2.0 lens ensures that everything between the A-pillars is captured on the video. With the supplied quick release mount, you can also fit a 52mm CPL filter to reduce dashboard glare. The Opia2 is one of the best dash cams in high heat environments and suffers from no heat related focus shift issues. It's rated to work at temperatures up to 75℃ (165F) and can take memory cards up to 128GB for up to 10 hours of recording at the highest resolution. It's a great choice for 24/7 recording since it can support high temperatures and large memory cards. 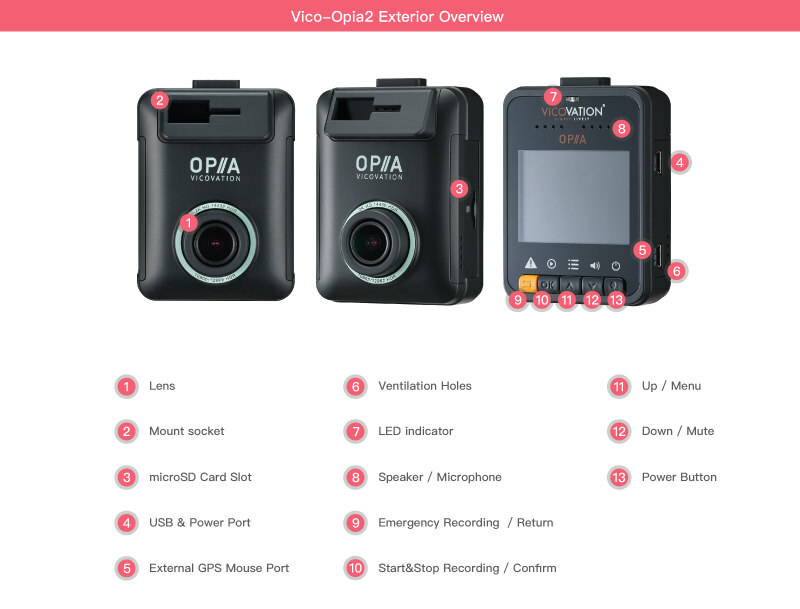 When paired with a dedicated hardwiring kit or battery pack the Opia2 can be set up to record in VicoVation's Smart Parking Mode using motion detection or time lapse.